Anyone can be a Unicorn with this fun and simple and mess-free headband. No painting is required for this craft! Draw and cut out a large triangle from white felt that is 7cm long and 16cm tall. 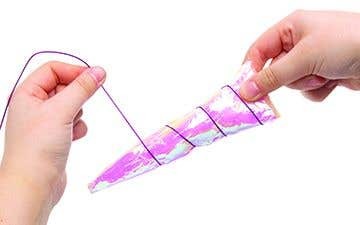 With an adult’s help roll the triangle into a cone and glue down the long edges, leaving the bottom of the cone open. Wait for a minute for the glue to cool and solidify before filling the cone with toy stuffing. Carefully pinch the opening closed and secure with glue. Repeat the beginning of step 1 by drawing and cutting out a 7cm by 16cm triangle out of iridescent cellophane. Place the felt horn in the centre of the cellophane triangle. The side of the horn touching the cellophane will be the front of the unicorn horn. Wrap the cellophane around the horn and glue it down at the back. Fold over and glue the bottom of the horn to seal any open edges. Starting at the base of the horn, on the back, stick down the end of some metallic pink cord. Wait for the glue to go rigid before pulling the cord around the horn, glueing each section at the back along the way. At the top of the horn, glue to the back as usual and snip off the excess so that the end of the cord cannot be seen from the front. Glue the completed horn to the centre of the headband, holding it in place as the glue cools. Draw and cut out 2 ear shapes from white felt that are 7cm tall and 4cm wide. Round off the corners so that there are no sharp points. Draw and cut out 2 smaller shapes on pink felt that are 4cm tall and 2cm wide, rounding off the corners of these as well. Glue the pink felt to the inside of the white felt to make the ears. Make sure the glue is cool before continuing. 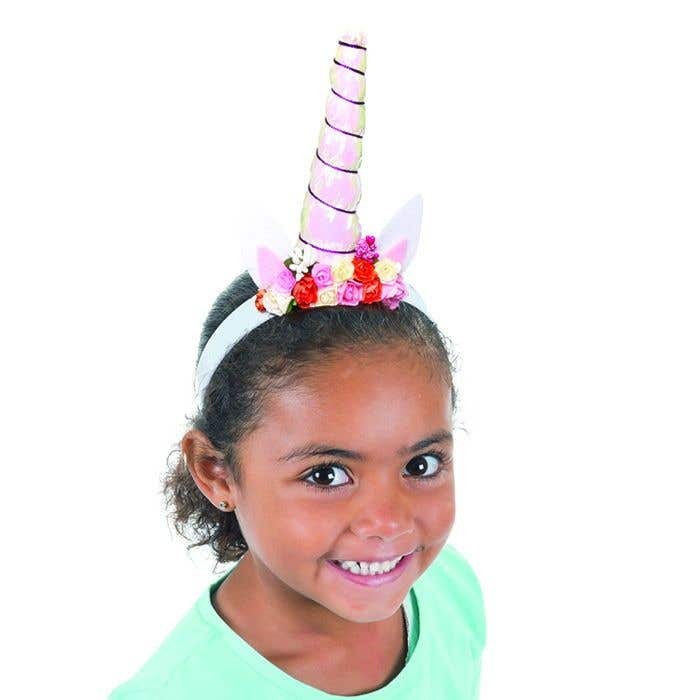 Apply glue along the flat edge of one of the ears and stick it next to the unicorn horn on the headband. Repeat this with the second ear so that they are either side of the horn. Have an adult trim the wires on the backs of the paper flowers. Starting with the biggest flowers glue them along the front of the headband spanning from ear to ear. Wait a minute for the glue to cool before sticking a small flower at both ends of the row that was just made. Stick more small flowers along the top of the bigger ones, covering the base of the unicorn horn and ears. Glue two of the bobbly flowers in the gaps between the ears and the horn to add some texture to the headband. 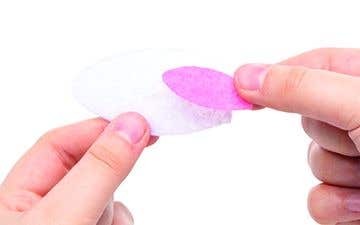 Make sure the glue on the headband has cooled completely before using. We used a hot glue gun for this project. However, you can use Super Tacky Glue but you will need to allow extra drying time.